Play dough is our go-to sensory activity for when I don't have any sensory activities planned or I need to keep the boys busy while cooking supper. That's why you will always find a bag of homemade play dough in our fridge. 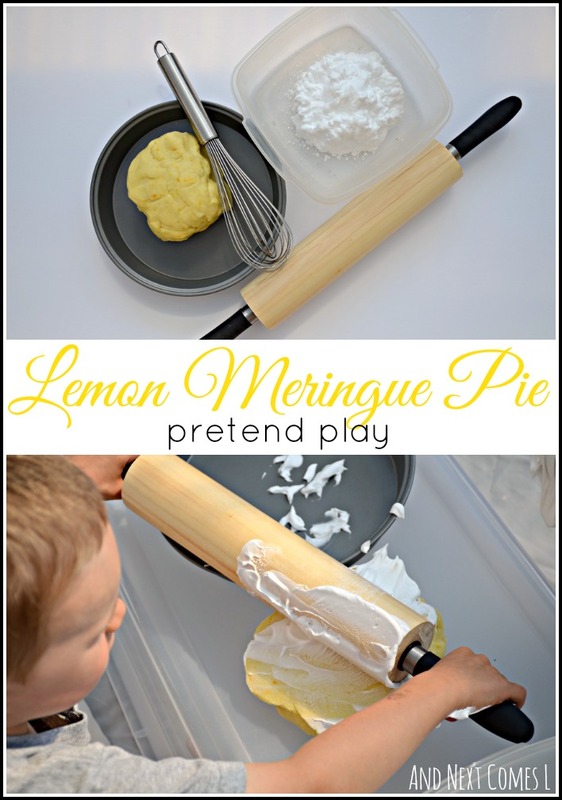 Recently I made lemon scented play dough, which ultimately led to this messy lemon meringue pie pretend play prompt. Round pan - I had no pie plates around. Playing with play dough, using the rolling pin, and whisking are all great for fine motor development. Plus, the boys get to play with real kitchen utensils. Not that kitchen utensils have ever been off limits for them. J preferred to roll the play dough, while K commanded the whisk. Now let's check on the progress of that meringue...ah, a stiff peak! Good whisking, K! Then just like regular baking in our house, things got messy quickly. No pie was ever made, but it was a lot of fun to play with! Looks like fun - I bet the lemon smelled great too!